British Grand Prix | B.I.R.D. Discussion in 'The Sports section' started by KUCIAR666, Aug 24, 2017. After a successful one-day test at the Misano World Circuit Marco Simoncelli last Sunday, the riders arrive at the twelfth round of the MotoGP World Championship relaxed and positive about their chances this weekend at Silverstone, a circuit with fast sweeping corners that's well suited to their YZR-M1s. At the end of the previous round, Viñales already expressed his excitement to take part in the British GP on a Yamaha, which he feels should complement his riding style to a tee. The Spaniard has tasted sweet success before at the Silverstone Circuit. He secured a Moto3 class victory there in 2012 and a third place in the Moto2 class in 2014, but the highlight came last year, when he took his first ever MotoGP victory. This year he is eager to defend the golden trophy at the British venue. Holding third place in the championship standings, he is fully focused on decreasing the 24-point gap to first place. After the full-on test in Misano, teammate Rossi is also looking forward to putting on a show for the British fans. He still thinks back with pleasure to his 2015 win at Silverstone. When the British Grand Prix moved there in 2010, he missed out on the first edition due to injury, but stood on the podium two further times when he scored two third place finishes in 2014 and 2016, giving him a 50% podium rate at the Silverstone track. This weekend the Doctor will again be aiming for a top result, as he is fully aware we have come to a very important point in the season. He holds fourth place in the championship standings, 33 points behind the leader, and is determined claw his way back up the rankings. After innovations and investments, Silverstone was added to the MotoGP calendar seven years ago. The circuit's new lay-out made it one of the fastest tracks of the season and saw it become a favourite amongst riders and fans alike. The track has over 60 years of history, and with the championship being as close as it is, the riders are eager to make this year's race another unforgettable event. The upcoming British Grand Prix is extra special as the Factory Yamaha riders, in cooperation with the team's title sponsor Movistar, will be showing off a new sticker on their bikes. Both Viñales and Rossi will sport a "#rodamosjuntos" logo on their YZR-M1s at the rounds in Silverstone and Misano, as a part of a safe driving awareness initiative started by Movistar. The safety campaign was launched during La Vuelta (from August 18th to September 9th) to promote mutual respect between drivers and cyclists on the road. "I'm really excited to arrive at Silverstone again. It's a special track for me as I won my first MotoGP race there last year, so I will give my 100%. We completed the private Misano test with a good feeling and we will work hard to find a good set-up when we start work in Silverstone on Friday. I like the track lay-out a lot, because there are many fast corners, many chicanes, and that's something that really suits my riding style. Honestly, it's one of the best tracks on the calendar. It's one of the Grands Prix that I'm always eager to go to and I will do my best and give my maximum to repeat last year's victory." "We go to Silverstone after a day of testing in Misano and I want to go back on track immediately to find out if we have been able to find positive solutions to improve our bike. Silverstone is a very fun and beautiful track but also very demanding. This track is very long and there are so many changes of direction at high speed. It's important to find a perfect set-up of the bike, in braking and in the fast corners. It's a really nice track for me and for my riding style. I want to do a good weekend and fight for the podium." "After the test in Misano last Sunday we arrive in Silverstone. The team is looking forward to getting this weekend started because the track's fast lay-out suits our bike, as shown in the results of the previous years. Our riders like the track's lay-out as well. Both Maverick and Valentino secured superb victories there and, after completing many laps during the private test last weekend, they will commence the British round with a good confidence and a positive mind-set. The team is 100% committed to produce the best results possible. We want to give the crowds a good show, but there is also a serious message to be delivered. As a part of Movistar's initiative, our riders will sport a slightly amended livery during the race weekend in Silverstone, as well as during the next round in Misano. Their bikes will feature #rodamosjuntos to promote safe driving, especially with regard to cyclists. The Monster Yamaha Tech3 riders keenly await the round 12 fight at the iconic Silverstone circuit where they once again aim to duel with the leading MotoGP bikes. After finishing the Austrian round as the leading Yamaha rider and in 5th, Johann Zarco fully intends to take advantage of the flowing and high-speed nature of the British circuit to clinch the top independent honours on Sunday. Whilst Jonas Folger plans to bounce back and fight with his teammate for a top-five finish to continue the highly positive start to his MotoGP career. The action commences at 09:55 this Friday. "Silverstone is a very fast track and I am happy to go there after the solid and rewarding weekend that we had in Austria. I have a high level of motivation again so my target is to fight with the top guys and to collect as many points as possible for the championship. In the past, I have been competitive at Silverstone in Moto2, so I hope I will feel good on my Yamaha MotoGP bike. I am sure that I will be confident and I aim to manage the tyres as well as I can in order to have a strong race and then finish close to the front." "I really like the Silverstone track so after the unlucky weekend that we had in Austria, we are looking forward to the British Grand Prix where we will attack and try to clinch a good result. I am certain that we will come back in a strong way and we have to collect points because Brno and Spielberg didn't go to plan. I'm sure that we can show our true level at Silverstone, which is a circuit that I really enjoy riding at. I have great memories there, including my first-ever victory in the 125cc class and some other solid results. I hope that we are going to try the new winglets too, which we are supposed to get at Silverstone so it will be interesting to work with the new aerodynamic parts. I'm sure our hard work will get us close to the top and I'm excited about the British GP challenge." "After a short rest following the back to back races in the Czech Republic and Austria, the Monster Yamaha Tech3 team is more than ready and excited to go to Silverstone. This will be the first time in many years that we have not had an English rider in the Tech3 team, after James Ellison, James Toseland, Bradley Smith and Cal Crutchlow all spent time with us. Anyway, our team has always had an incredibly warm welcome and a strong level of support from the British crowd, who I think are possibly the best fans in the world. This is because they love travelling and they know so much about our sport, plus it is a real pleasure to meet some of these people at Silverstone every year. A big moment of the weekend is the Riders for Health auction on Thursday, where the paddock is open and we can meet so many people. It's a really special, friendly and family orientated event where a lot of riders as well as team managers go onstage to answer the public's questions and share our passion for MotoGP. With regards to our guys, Silverstone is a track that both of them enjoy. There was a memorable battle there last year in Moto2 and Johann and Jonas did a great job. The Yamaha goes well at the circuit so everyone is ready for a great event and our boys are fully fit and raring to go. I really hope that we can please the crowd and a podium in the UK would be like a dream, so this result would especially reward the two English Monster Yamaha Tech3 members on their home soil. Steve Blackburn is Johann's mechanic who has been with us for many years, and Wil Moody is our social media coordinator and press writer and one of the important people in our communications team. We are ready for this special event." 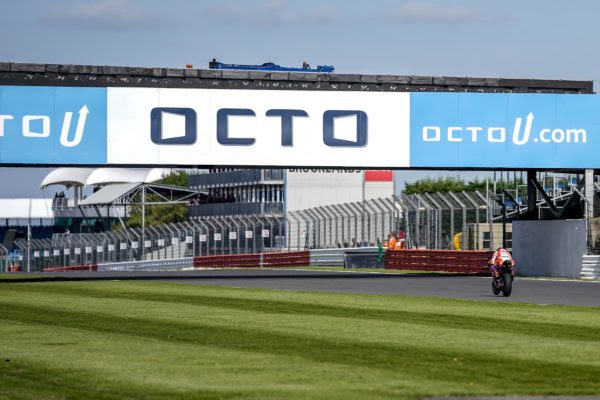 Octo Pramac Racing returns to Silverstone, that can be considerated a second home Grand Prix. 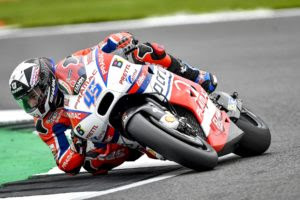 During the Friday of the Octo British Grand Prix, Scott Redding ended in top 10 with a good feeling, while Danillo Petrucci was unable to be competitive in the second part of the circuit. Is a real “Home GP” for Scott and after bringing enthusiasm to all supporters yesterday with an outfit in real Union Jack style, today he was able to find a good feeling during FP1 ending in P9. In the afternoon, despite a higher temperature, the English rider continued to lap consistently and during the in the time attack he conquered a 10th place that can be determinant for direct qualification to the Q2 in case of rain tomorrow. On the other hand, Petrux had some more problems to face. During the time attack of the FP1 he was forced to stop because of a small technical problem. While in FP2, despite the top speed of the day (328 km/h), he was not able to find the right feeling in the second part of the circuit in order to stay in the Top 10. "It has not been a positive day. The lap-time on this circuit depends mostly from the lines, and if I have to be honest, there is not a lot to change regarding the set up. We are however confident, we have ideas and we are in line with the other Ducati. We will try to solve our problems even if we still suffer more than the others due to this bumpy track. The new flag to flag procedure? In my opinion, this method offers more security". "I am happy for this Friday. This morning I think I have struggled with the electronics, but I have probably used the wrong map. However, I was not worried even If I had some problems with front movements. We have tried to change the front tire and we will continue to make experiments tomorrow. I am confident also because during the time attack I have made a small mistake". Movistar Yamaha MotoGP riders Valentino Rossi and Maverick Viñales kicked off the Octo British Grand Prix showing good form. Making the most of the perfect riding conditions in today's two free practice sessions, the teammates set up their bikes for Sunday's race and secured second and third place respectively in the combined times. Rossi showed a good pace in the morning and was ready to get work done. Wasting no time to test some of the solutions he found in the private test in Misano last week, he soon got into a solid rhythm. The Italian steadily dropped his times to take over third place 15 minutes into the session. He held on to his position, until the times quickened, but the Doctor was swift to respond. He slotted into second with a 2'02.995s lap, directly behind his teammate and focused on fine-tuning his bike in the final 15 minutes, ending the morning session in fifth place, 0.865s from his teammate in first. The nine-time World Champion also had a positive session in the afternoon. Once again making his intentions known, he held provisional third position before the pace picked up at the end of the session. Finding himself in 11th place, with six minutes to spare, Rossi headed back out to give another push. He set a 2'01.138s on his penultimate lap to take second place, 0.241s from first. His FP2 result earned him the same position in the combined times, ahead of tomorrow's sessions. Viñales used FP1 as the first occasion to remind race fans and rivals of his strong form at the Silverstone Circuit. Last year's British Grand Prix winner started the morning Free Practice session with a competitive pace. He worked diligently on his bike's settings throughout, making his statement in the final stages after the flag went out. He topped the FP1 standings with a 2'02.130s best time and a 0.519s margin to his closest rival. The Spaniard gave another strong performance in the second 45-minute session. Directly on the pace, he posted low 2'02s and held on to fifth place until the final minutes. Having been pushed back to tenth position by rivals setting hot laps, Viñales felt encouraged to put his head down in a 'mini time attack'. He fired up his Yamaha once more and dropped a 2'01.168s to set the third fastest time of the day, 0.271s from the front. After FP2 the Movistar Yamaha MotoGP teammates successfully completed the test of the new flag-to-flag bike swap procedure with positive thoughts on its possible implementation in the future. "It was a good day, because first of all we had fantastic unbelievable weather for Silverstone and the track is in a good condition. Riding the MotoGP bikes on this track in these conditions is a great pleasure, a lot of fun. From the first lap I had a good feeling with the bike and I feel good with the balance, with the setting, so I was quite strong. We have a lot of work, a lot of things to do, but we are quite competitive. About the new procedure, for me it can be OK, but if they modify the rules for the problem in Brno, between Espargaró and Iannone, also with this procedure, it will be exactly the same. It doesn't change a lot. Later we will go and speak with the Safety Commission and we will see also what the other riders think." "I feel good. Honestly, with the race pace we were quite competitive and I felt great on the bike again. I was riding in my own style and it was really nice to be as competitive again as we were at the start of the season. In the time attack I didn't feel as good, especially with the front. It was the first time I tried the hard tyre, so I was not trusting the bike enough. Anyway, I'm there, so I'm happy and quite confident that we can do a really good job tomorrow. In my opinion the new flag-to-flag procedure is quite good. Later we have to decide with all the riders and Dorna at the Safety Commission, but I think it was quite OK. The space was a lot bigger, so for me it was nice." "We completed a lot of work at the Misano test last week, but we had some question marks about how our new findings would translate at the Silverstone Circuit, which is a track with quite a unique character. So far, we are satisfied with the work we got done in the first two sessions. Both riders felt comfortable on their bikes right from the start of FP1. We tested some different tyres - soft, medium and hard- between the two riders, and we will keep working on that tomorrow, because it will be fundamental to find the right tyre for the race. Both Valentino and Maverick rode consistently fast times and clearly showed that they have good pace and speed, even on used tyres. We ended the day with the quick test to assess the new bike swap procedure. The riders seemed positive about the increase in safety, so we feel it could be an improvement." The Monster Yamaha Tech3 pair started their British Grand Prix campaigns today as they both took the first steps in preparation for Sunday's showdown. Johann Zarco began the weekend with instant speed after completing FP1 in 7th and he continued his positive pace in the afternoon before finishing in 8th overall and a second back from first. Whilst Jonas Folger endured a more challenging day under the English sun due to an illness, however he aims to recover overnight and then bounce back fully tomorrow. "I am pretty happy that we had clear weather conditions today at Silverstone and this was good for my confidence. This morning, it took me some time to find the references on the track, but overall, I felt good because I used the same tyre and I finished in the top ten. In addition, we started to work on trying to find a good setup. Then in the afternoon, we knew that the conditions would be even better so we tested some tyres, which were positive and then in the end it was necessary to use the soft compound in order ride the quickest lap that I could. However, I'm not totally satisfied about this last lap, but the most important thing is that I'm inside the top ten. We can work on the bike and improve the feeling more, so I hope that we have the same weather conditions tomorrow and we can keep this positive momentum going." "It was a really hard day for me. I have been struggling a bit with some sickness recently and even though it is gradually getting better, I was not able to push 100% today. I was not feeling completely confident because of this condition, but I still rode some laps, yet I also tried to rest. I aim to recover as well as I can overnight and then make a big step forward tomorrow." 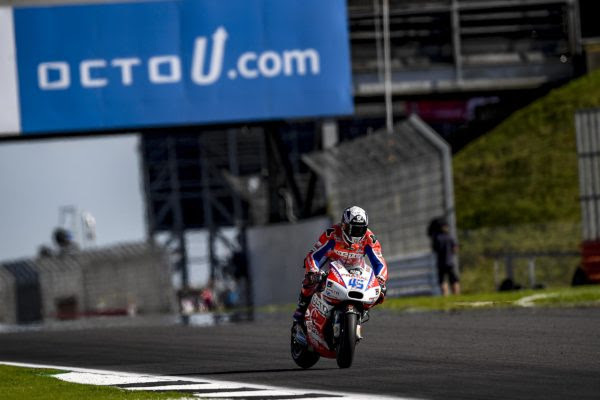 The Saturday of the Octo British Grand Prix didn’t give particular satisfaction to the Octo Pramac Racing team. 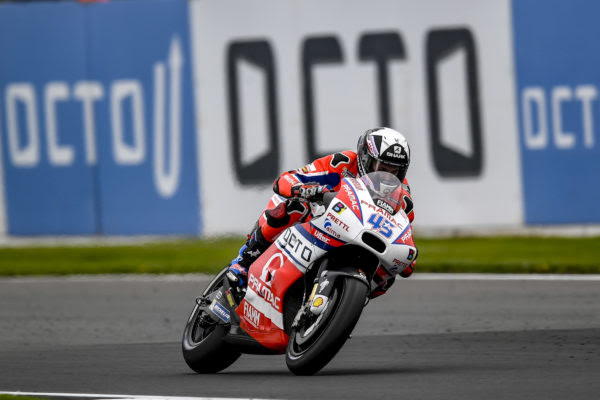 Scott Redding did not manage to find the right conditions in order to be competitive in the Q2 after a promising FP3 and a good feeling during the FP4. Scott will start from P12. Danilo Petrucci, forced to pass from Q1 after the difficulties of Friday, he tried to avoid traffic on track in order to be competitive in the time attack, but he crashed in the first. Unfortunately, the feeling with the bike-2 was not one of the best. 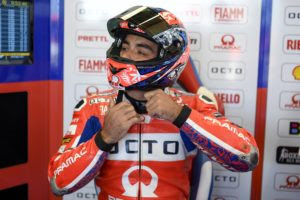 Petrux will start from the 18th position tomorrow. "It was very difficult qualify, but if I have to be honest the feelings for the race are good. We had many difficulties yesterday, but we worked well and the race pace during the FP4 was quite convincing. Unfortunately, I made a mistake in the Q1: they were all behind me and I wanted to lap alone. I will start from behind but I am confident". "Qualifying did not go well. If I have to be honest, I am a bit surprised because the feeling was good. However, when I went on track I couldn’t’ find grip and the feeling got worst compared to the FP3. I still believe that I can do a good race tomorrow. A good start will be fundamental". Marc Marquez (Repsol Honda Team RC213V) produced another herculean performance at the Red Bull Ring this afternoon, riding to his 70th Grand Prix pole position across all three classes: MotoGP, Moto2 and 125cc. Tomorrow the reigning MotoGP World Champion will chase a hat-trick of victories, after taking the win at the last two rounds in Germany and the Czech Republic. The 24-year-old Spaniard’s performance proves the effectiveness of recent work undertaken by HRC and Repsol Honda. Last August Marquez had one of his toughest races of his title-winning season here, finishing in fifth place, but diligent work by HRC engineers has improved corner-exit acceleration, which is more vital than ever at this track, which is characterised by three slow-speed corners followed by long straights. At last Monday’s Brno tests Marquez’s Repsol Honda crew worked on a variety of set-ups designed to increase performance here. Marquez bounced back from a minor tumble during FP4 today to stamp his authority on qualifying, dominating the session from its midpoint to the chequered flag. The three-times MotoGP king and former Moto2 and 125cc World Champion is currently riding a superb season, with three wins and three further podiums already. These results have given him a vital 14-point lead in the World Championship. Riding at arguably MotoGP’s most picturesque venue – the Red Bull Ring is nestled in a beautiful valley in the Austrian Alps – Marquez’s best time this afternoon put him 0.144 seconds ahead of second-quickest Jorge Lorenzo, with Lorenzo’s Ducati team-mate Andrea Locatelli completing the first row. Honda’s next best rider in qualifying was Marquez’s team-mate Dani Pedrosa (Repsol Honda Team RC213V), who came into Q2 from Q1 to secure a third-row start, with eighth-fastest time. The former 125cc and 250cc World Champion had some issues during free practice and had to go through the Q2 qualifying process. In the end he was happy with eightth, just 0.75 seconds slower than his flying team-mate. He goes into this race with three podium finishes from his last four outings. Cal Crutchlow (LCR Honda RC213V) was Honda’s top independent rider this afternoon, going ninth fastest to complete the third row, following a tumble during an earlier practice session. The Briton is confident of a good ride tomorrow, so long as he can make a good start from the third row of the grid. Crutchlow is especially keen for a good result here, with his home race at Silverstone up next. Jack Miller (Estrella Galicia 0,0 Marc VDS Honda RC213V) was 19th this afternoon, five places ahead of his team-mate Tito Rabat (Estrella Galicia 0,0 Marc VDS Honda RC213V). This track and its low-gear corners make wheelies a problem, and Miller and Rabat don’t yet have the aerodynamic aids recently made available to Marquez, Pedrosa and Crutchlow. Movistar Yamaha MotoGP's Valentino Rossi set a scorching pace in this afternoon's qualifying session at a sunny Silverstone Circuit to score second position on the grid for tomorrow's Octo British Grand Prix. Teammate Maverick Viñales also attacked the shoot-out at full speed and took fourth place. Rossi headed out on track in the Q2 session in the middle of the 12-rider field, but he didn't let that spoil his rhythm. On his first flying lap he set a personal benchmark time of 2'01.219s for fifth place. Unable to better his time with his next attempt, he dropped down the order and held eighth position as he entered the pits with a little more than six minutes of Q2 remaining. A quick minute later, the live timing was flashing red sectors for various riders, including the Doctor. The Italian was on an absolute flyer and set a superb 2'00.025s for second place, 0.084s from first. He had time for one more lap, but didn't improve, and will start tomorrow's Octo British Grand Prix from the middle of the front row. Viñales followed his teammate out of pit lane at the start of the 15-minute shoot-out. He immediately put his Yamaha YZR-M1 inside the top-3 and followed it up with a 2'00.485s for second place on his second try. The young Spaniard quickly made his way back to the Movistar Yamaha box for a set of fresh tyres. When he was back out on track with five minutes remaining, the riders' provisional ranking shuffled as the times dropped. Viñales set a personal best lap, a 2'00.341s, for fourth position, 0.400s from the front. As he was unable to make further progress on his last lap, he will start tomorrow's race from the second row of the grid. "I always lose a bit in the final section, I have a bit too much spin. I think I had a big advantage up until that point. Marc was barely inside the 1'59.9s, so I lost a bit, but not a lot. I'm close to the pole position, unfortunately it was not enough, but I'm so happy to start from the front row, that's very important for the race. With the pace we are not fantastic, we're a bit in trouble. I hope we have the time to try to fix all of the last details and I hope to be competitive tomorrow and fight for the podium." "I feel OK. I think we did a good job, especially in FP4, I'm quite happy about that. For qualifying we modified the bike a little bit and I didn't feel that great, but anyway we know that we are quite strong here and tomorrow we are going to try to do our best. We didn't make one big improvement today, we made small ones. Tomorrow we have one more chance to work and try to improve." "Both sides of the garage did a good job today. For sure Vale would have liked to secure the pole position in front of the passionate British fans. He was very close, only missing out by 0.084s, but being able to start from second place, from the front row, is a really good result. Maverick will also be starting from a good position, from fourth place on the second row. He feels comfortable on the bike and he's happy about the job he was able to do today, though we think there is still some room for improvement. During FP4 we faced some difficulties with the pace and we need to understand the reason. It might be due to a change in track conditions following this morning's rain, or there might be another reason, so we will continue to work tonight, and tomorrow in the warm up, to prepare for the race." "Overall I am pleased with my starting position for the British Grand Prix. In FP3 we made a good step with the bike and compared to yesterday, I felt much better. To be honest, this morning I didn't expect to improve on my lap but I managed to do this which was very positive. Then in Free Practice 4, I ran a solid rhythm and the times were more than satisfying, but it is difficult to keep the pace for the entire race distance at this circuit. Therefore, I think that this will be the biggest challenge, but I will fight. Anyway, because FP3 went well, I felt confident to push in qualifying and I rode some good times. It's a shame that on the last lap I just missed out on the second row, which I think was certainly achievable. However to start from 8th is not a drama and it's actually positive, as I feel comfortable on the bike and I will push. Tomorrow, I aim to wake up well and then stay relaxed because this will be key for the afternoon." "I am really happy because we made a big improvement on the bike and I made a good step forward with myself. Yesterday was tough, but I felt much better today and we had a positive time in qualifying. We were able to try a different setting which made the Yamaha more stable on the exit and calmer overall. In addition, I was able to get out of Q1 which was very positive because it is never easy to do this. The team and I can be pleased as we did a great job but I think that we still have some room to improve, especially with regards to the front of the bike. We will analyse everything now, but for today, we went about things in the right way. Thanks to the team who worked really well and I'm sure that we can make another solid step tomorrow." 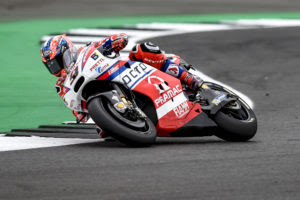 The Octo #BritishGP has brought great emotions to the Ducati fans thanks to the victory of Dovi, also Scott and Petrux are absolute protagonist of a comeback race, as they had to start respectively from 12° and 18° position. Scott race pace was very competitive and permitted him to stay in the top 10 in the first laps. 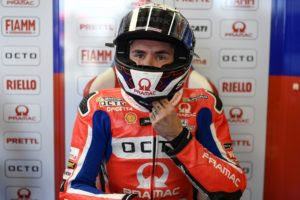 Redding remained focused, lapping very fast in his solid race, and ended the race with a precious 8th position. Petrux was forced to start from the 6th row and the first lap was not one of his best. The comeback was however enthusiastic. The rider from Terni was in the top 10 until he remained involved in a crash generated by Andrea Iannone. "It was a good race. I am very happy for how things well during this GP. The race pace was good and I have to thanks the team for the work done in order to resolve the problems of Friday. I want to thanks also all the fans that have supported me. It was a good day for us".